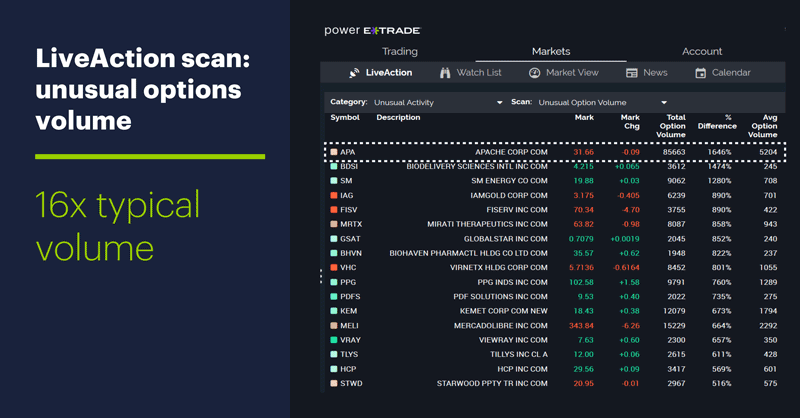 Options activity can sometimes offer insights into potential stock moves, but experienced traders know not to jump to conclusions about what initially jumps off their screens. Volume was split fairly evenly between calls and puts, although that meant puts were trading nearly 24 times as much as usual while calls were trading a little more than 12 times their average pace. Other than the sheer number of contracts, this activity was also conspicuous because it came a day after implied volatility (IV) in certain APA options caught the eye of some traders. On Tuesday, IV in the $40 put options expiring on January 18 was exceptionally high.1 Implied volatility is the market’s estimate of future (30-day) stock volatility than is embedded in an options value. There are a couple of things to consider in terms of unusual IV levels. First, the implication of high IV is that traders are expecting volatility—a potentially big move in the stock, up or down (or both). That doesn’t mean traders are right, it just means that’s what they’re expecting. Second, all else being equal, the higher the IV, the higher the options price, and vice versa. So, did that mean APA shares were gearing up to make a high-volatility move? 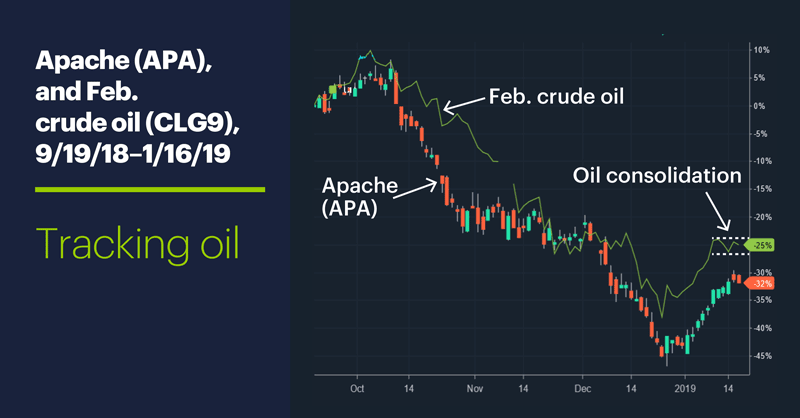 And although it’s not obvious from the chart, after rallying around $10 (23%) off its December 24 oil, crude has spent the past five days in a trading range between roughly $53.30–$51.30. A lull before another gusher erupts? Perhaps—and then there’s the question of whether it would gush up or gush down. But that’s not the real rub. While it may all have seemed to point to the potential for a high-volatility move in APA, a closer look at yesterday’s high-volume options revealed open interest (OI)—the number of open positions—was very low in those contracts—next to nothing, in fact. That means the activity wasn’t traders opening new positions, it was traders closing existing positions—something that doesn’t really support the “traders positioning themselves for a big move” hypothesis. But there’s always a flipside to the coin. In this case, APA options with high IV may be attractive as short-trade candidates (short calls above the market, short put below it, or both) for traders who don’t expect a high-momentum move in crude oil or APA. The puzzle isn’t always what it first appears to be. Don’t make a decision until you have the last piece in place. Market Mover Update: Micron Technology (MU) traded down to its former breakout level Tuesday and yesterday (see “Chip stocks flip the switch”). Breakout watch: Yesterday gold extended its increasingly narrow trading range for a ninth day. February gold futures (GCG9) traded between $1,296 and $1,287 yesterday. How strong has this New Year’s rally been so far? As of yesterday—the 11th trading day of the year—the S&P 500 (SPX) was up more (around 4.5%) than it’s been at this point in all but six other years since 1950. Today’s numbers (all times ET): EIA Natural Gas Report (10:30 a.m.). Scheduled but not expected to be released due to government shutdown: Housing Starts (8:30 a.m.). Today’s earnings include: Netflix (NFLX), BB&T Corp. (BBT), Fastenal (FAST), JB Hunt Trans (JBHT), KeyCorp (KEY), Morgan Stanley (MS), Taiwan Semiconductor (TSM), American Express (AXP), Atlassian (TEAM). 1 Zacks.com. Implied Volatility Surging for Apache (APA) Stock Options. 1/15/18.